Joe Root became England's all-time leading one-day international century-maker as an innings of exactly 100 not out on his Headingley home ground saw the hosts to an eight-wicket victory over India on Tuesday and a 2-1 series win. This was Root's second unbeaten century in successive innings after his 113 not out helped England level the three-match contest with an 86-run win at Lord's on Saturday. This latest hundred was also Test skipper Root's 13th in ODIs, taking him past the England record of 12 he had previously shared with Marcus Trescothick. Tuesday saw Root and England one-day captain Eoin Morgan (88 not out) share an unbroken third-wicket stand of 186. For 2019 World Cup hosts England, who've yet to win that showpiece event but are now first in the ODI rankings to India's second, this was a morale-boosting victory. Last year's Champions Trophy semi-final loss to eventual champions Pakistan in Cardiff was England's 13th defeat in 19 ODI tournament knockout games. But having said they would treat Tuesday's match as a dress rehearsal for a winner-takes-all game at the World Cup, England will be delighted by this comprehensive success. It was England's bowlers who set up this win, with Adil Rashid and David Willey, two of the five Yorkshire cricketers in their XI, taking three wickets apiece. But, after left-arm quick Willey had kept things tight at the start, it was leg-spinner Rashid who did significant damage by taking two wickets in an over. He bowled India captain and star batsman Virat Kohli (71), as well as dismissing Suresh Raina, on his way to figures of three for 49 in a maximum 10 overs. Willey, who took three for 40 in nine overs, received excellent new-ball support from Durham quick Mark Wood (one for 30). MS Dhoni, criticised for slow scoring at Lord's, was caught behind off Willey for 42 off 66 balls. It was not until the penultimate over that India hit their only sixes of the innings, with tailender Shardul Thakur twice pulling Ben Stokes high over square leg in a useful 22 not out. The normally fluent Rohit Sharma, who scored a superb century during India's eight-wicket win in the series-opener at Trent Bridge, struggled to make two off 18 balls, his innings ending when he flicked Willey to Wood at deep square leg. But the introduction of Yorkshire fast bowler Liam Plunkett helped India break the shackles. But Stokes ran out Dhawan for a fluent 44 with direct hit after the left-handed opener was sent back by Kohli. Dinesh Karthik, preferred to KL Rahul for this match, then made 21 from 22 balls before he was bowled between bat and pad by Rashid. Kohli pressed on, however, completing a 55-ball fifty including six fours before Rashid struck twice in quick succession as India's 156 for three was transformed into 158 for five. Kohli's innings ended when he was bowled by a superb leg-break from Rashid that pitched on leg stump and hit off. A disbelieving Kohli walked off and Raina (one) then turned Rashid low to Root at leg slip. 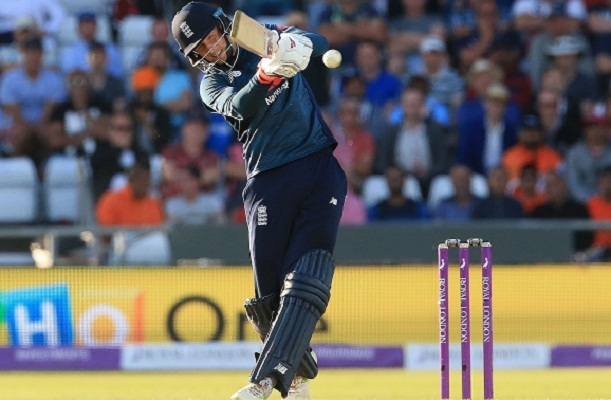 James Vince, called up in place of the injured Jason Roy cut the first ball of England's reply, from Kumar for four. Yorkshire's Jonny Bairstow was even more fluent, hitting 30 off 13 balls, including seven fours, only to chip Thakur to Raina at midwicket. Vince's frustrating England career has seen him repeatedly get out when well set and Tuesday was a case in point when he ws run out for a run-a-ball 27, although it needed a brilliant one-handed take by wicket-keeper Dhoni, from Hardik Pandya's throw, to complete the dismissal. Root, stumped off a Yuzvendra Chahal no-ball on 69, went to his century when he pulled Pandya through midwicket for his 10th four in 120 balls as England won with 33 deliveries to spare.